Living in a Little Egg Harbor 55+ community certainly means a serene retirement. Strange but true, Little Egg Harbor got its name when the Dutch sailors that came here in the 1600s found eggs inside of gull nests in the area. One of its first settlers, Hendrick Jacobs Falkenberg, chose an 800 acre plot that included Osborn Island (also called Mystic Island) and Wills Island. The former is a historic landmark, as British troops tried to march inland from here in October of 1778 during the American Revolution. Revolutionary War history is only part of this small town’s appeal for active adults. 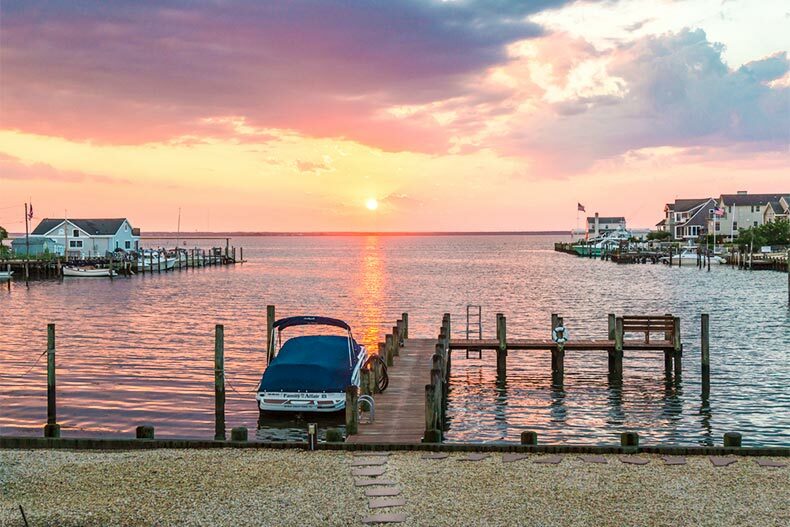 Everything about Little Egg Harbor is low-key, including its small population (around 20,000), friendly residents, and long, lazy summers. It is about 30 miles north of Atlantic City, and about 20 minutes or so from beach towns like Beach Haven and Long Beach Island. It also sits at the edge of Bass River State Forest, a 23,563-acre state park with a 67-acre lake where visitors enjoy swimming, hiking, and boating. The next town over is Tuckerton, which is a haven for beach and boating fans with its many marinas, waterfront activities, and the Tuckerton Seaport and Museum. Seafood lovers can find the freshest fish and shellfish at local eateries like Parson’s Sea Food and Mud City Crab House, or enjoy other cuisines at any of the area’s many fine eateries. Little Egg Harbor locals enjoy modern conveniences, with a Walmart Superstore and other grocery stores and pharmacies right in town. Top area medical facilities include Hackensack Meridian Health in Stafford Township and Fresenius Medical Care. Here are four active adult communities in Little Egg Harbor. Affordable and small-sized, Cranberry Creek is a newer 55+ community with 325 single family resale homes. It was built in a rural setting with some waterfront homes on its property. There are five ranch-style floor plans ranging from 1,126 to 2,184 square feet. These offer two bedrooms, two to two-and-a-half bathrooms, and attached one or two-car garages. Some models have second-story lofts and dens; other features include nine-foot ceilings, hardwood floors, upgraded kitchens, and luxurious master suites. The modern community clubhouse has game rooms, a fitness center, and a ballroom. Warm weather activities focus on the lovely outdoor pool, horseshoe pits, tennis, and shuffleboard courts. Residents also spend quality time at book club, the ladies’ club, men’s club, poker nights, holiday parties, art class, and their own chapter of the Make a Difference Club. Sunrise Bay is another newer single-family home active adult community, but a bit smaller than Cranberry Creek. The 250 resale homes come in seven different models that range from 1,270 to 2,175 square feet. They have two or three bedrooms, two bathrooms, and attached one or two-car garages. Residents pay a monthly homeowners’ association fee to cover community costs. The 10,000 square-foot clubhouse features a stunning ballroom with a fireplace, a craft room, and a fitness center. Outside, there is a heated pool, a putting green, tennis, bocce, and horseshoes. Sunrise Bay residents also spend their free time at Dancercize, ice cream socials, playing cards, attending movie nights, and exploring all around with the travel club and bus trips. This active adult community is about 15 minutes from Stockton State University, which offers continuing education courses for all ages. The Four Seasons brand is associated with the finer things in life, and their Little Egg Harbor 55+ neighborhood doesn’t disappoint. With 387 single-family resale homes, Four Seasons at Harbor Bay is a gated community next door to the Sea Oaks Country Club, which has a public golf course. There are 16 spacious models ranging from 1,838 to 3,430 square feet. These have two or three bedrooms and bathrooms, and attached two-car garages. Impressive features like granite countertops, magnificent owner’s suites, lofts, and dens all add to their appeal. Homeowners enjoy resort-style amenities at the state-of-the-art clubhouse, which has an indoor pool and spa, an exercise room, dance studio, activity rooms, and a business center. Outdoors there are tennis courts, a pool, a putting green, and a driving range. The community's social and activity groups keep everyone’s calendars full, as residents take part in ballroom dancing events, Aqua Zumba, a popular fishing club, poker, Mahjong, and a vibrant walking club. As one of the most budget-friendly active adult communities in Ocean County, Mystic Shores offers value and low-maintenance living in a tight-knit, established neighborhood. This property has 365 attached and single-family homes with a dozen different floor plans. These range from 930 to 1,760 square feet with two bedrooms, one or two bathrooms, and attached one-car garages. Some of these charming homes have screened-in Florida rooms, walk-in closets, and appliances. Mystic Shores’ long list of amenities includes a private clubhouse that has a ballroom, game rooms, a library, and a fitness center. The outdoor pool, shuffleboard courts, bocce ball courts, and walking & biking trails keep residents busy in the summer. The community bus is a convenient way for everyone to run errands and go on other trips. There is an annual yard sale, bingo games, bowling and sewing clubs, as well as men’s and women’s clubs, holiday parties, bus trips, and a travel club.